U.S. troops return to Afghan "Valley of Death"
KABUL, Afghanistan - Just months after pulling out of a remote slice of eastern Afghanistan dubbed the "Valley of Death," U.S. troops are back reinforcing their once-abandoned bases in the area  a hotbed of the insurgency and a dangerous second front in the decade-old war. Stationing U.S. troops again in the isolated, sparsely populated Pech Valley will boost the coalition's presence and firepower in the area near the Pakistan border just as the focus of the war shifts back to that region where infiltrating insurgents closest to al Qaeda and other militants hold sway. "The decision to send U.S. forces back to the Pech may also reflect a recognition that insurgent safe havens can cause us more harm than had been anticipated when we withdrew U.S. forces," said Mark Moyar, research director of the U.S.-based counterinsurgency consultancy Orbis Operations. "Insurgencies thrive on such safe havens and use them to stage operations elsewhere," he said. The U.S. military downplayed the decision to station troops again in Pech. The coalition, along with the Afghan National Army, always maintained a presence in the region, said Lt. Col. Chad Carroll, a spokesman for the coalition's eastern command. "It's just a matter of where they laid their heads at night," he said. Carroll would not say how many U.S. troops are now stationed there or how many more would be sent. The Pech Valley in Kunar province, with bucolic green farmland surrounded by sweeping mountain ridges, was the scene of some of the fiercest fighting in the war and claimed the lives of more than 100 U.S. soldiers by some estimates. In May, the U.S.-led coalition pulled out of the valley, saying it wanted to reposition its forces in areas where more Afghans live as part of strategy to protect large population centers and provide the Afghan government with an opportunity to extend its reach from Kabul and provide services to its citizens with the help of donor nations. The former eastern commander Maj. Gen. John Campbell told The Associated Press at the time that he did not want his forces stuck in static positions. He said he wanted them to be mobile and more able to chase insurgents sneaking in from hideouts in Pakistan. For years, eastern Afghanistan has been a far more dangerous place for terrorism than the south. Osama bin Laden's headquarters was in Kunar when he was fighting the Soviets. After the U.S. invaded Afghanistan 10 years ago, bin Laden sought refuge in Kunar and other eastern provinces. The caves of Tora Bora are in eastern Nangarhar province, bordering Kunar. And Nuristan, a lawless province where the Taliban and others control wide swathes of territory, is just north of the Pech Valley. Until last week's Chinook helicopter crash in eastern Wardak province's Tangi Valley that killed 38 U.S. troops and Afghans, the deadliest single incident of the war was a helicopter that was shot down in Kunar province. Sixteen special operations troops died in the June 28, 2005 crash. Just as in Pech, U.S. forces had left their remote base in Tangi, ostensibly to reinforce population centers and highways. 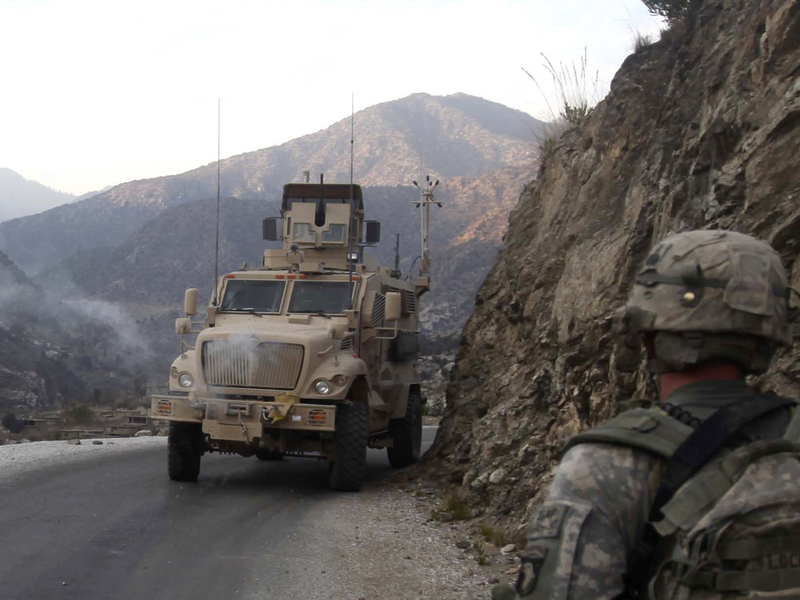 "Although special operations raids have given the insurgents some black eyes in the Tangi and other valleys abandoned by U.S. forces, they have not disrupted enemy operations to the degree that had been hoped," Moyar wrote in a recent editorial. "Shortly before the crash in the Tangi Valley, recognition of the dangers posed by insurgents have led to a momentous, if largely unnoticed, decision to reinsert a permanent U.S. troops presence in the Pech Valley," he wrote. American troops did not get a welcome mat on their return to the area in the last week of July. Insurgents fired at a coalition helicopter on July 25, injuring a few troops. A few days later, insurgents fired a mortar into a building at a base in Nangalam where U.S. troops were deployed. No deaths were reported. The new top U.S. commander in eastern Afghanistan, Maj. Gen. Daniel B. Allyn, said the U.S. presence again in Pech was part of the coalition's efforts to partner with Afghan security forces. "Frankly, there was a leadership challenge in the (Afghan Army) kandak (battalion) and when they replaced the leader that was there ... he did not take them forward as an independent force so we're going back in to restore that capacity," Allyn told the Long War Journal in an interview published this week. Allyn's comment seemed to indicate that the Afghan security forces were having trouble doing the job without their coalition partners, but the coalition denied this was the case. "Absolutely and unequivocally no," Carroll said. "During the last two weeks, the Afghan security forces delivered 200 tons of humanitarian assistance  complete with security  to the people of Nuristan. They were exceptionally well received by the Afghan people in that area. We had a very limited role in all of this."